LinkedIn has just released its annual list of the most sought employers and includes Apple at number seven —down one spot from the previous year. 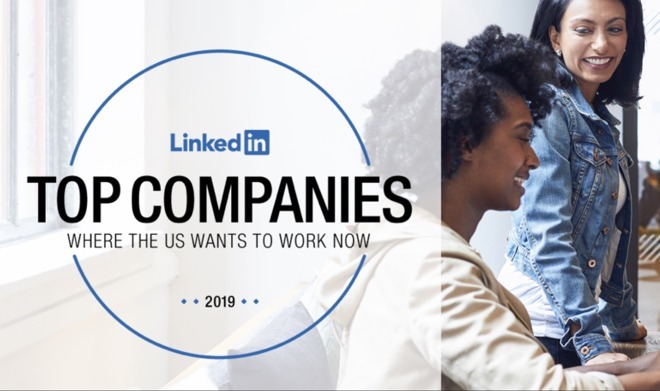 LinkedIn notes that tech companies continue to be in strong demand, with half of the top companies come from that industryAlphabet, Facebook, Amazon, Salesforce, Deloitte, and Uber all beat out Apple in the remaining top six spots on the list. Apple's headcount globally has buoyed from 123,000 to 132,000, according to LinkedIn. Engineering, IT, and sales were the three categories with the most new hires in 2019. More hires are expected to continue as Apple plans to create 20,000 new jobs over the next five years. To create their annual Top Companies list, LinkedIn users actions, and data collected from their 546+ million members across the world. They analyze actual user actions including job demand from job postings, engagement with the company, interest in its employees, and retention. Unlike last year, LinkedIn did not include particular reasons or perks as of why employees were drawn to Apple. Previously, LinkedIn cited Apple's maternity leave policy of 18 weeks for new moms, six weeks for dads, willingness to freeze eggs for those who prefer to defer parenthood, and the 25 percent discount on the company's devices as compelling reasons to join the iPhone and Mac maker.